I used iridescent watercolors on the wings and plaques; and regular watercolors on everything else. For the lettering, dots, and symbols I used gold, black, and white gel pens. View my progress through this painting via my Art Progressions’ slideshow. In the end this turned into a Chakra Meditation Mandala. Each of the plaques hold the mantras for the 7 main chakras, while the center holds the symbol for Om. 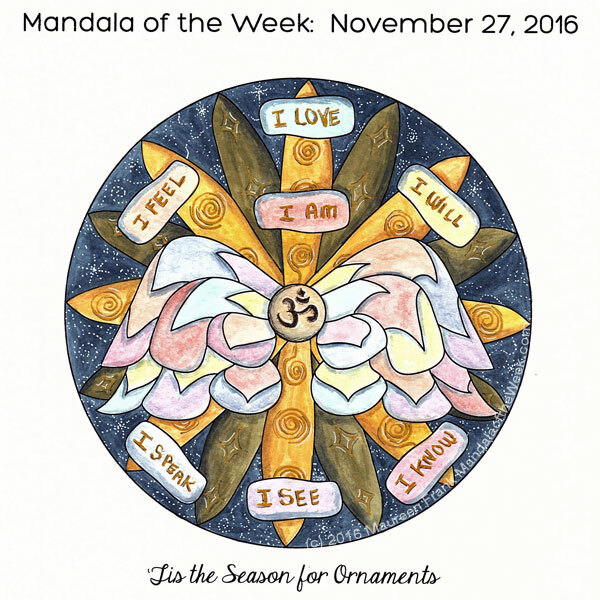 Essentially this mandala asks us to seek Holy Balance in every aspect of our lives, now more than ever to help us stay above the fray. from that Higher Place within ourselves while radiating it outward in all directions. Since time and space are an illusion in this 3-dimensional human existence, we only need maintain this Holy Balance for mere moments at a time. Know that EVERY little bit we can do matters greatly in our collective evolutionary process.